We need to talk about something serious: DC Comics is about to nuke my childhood. Wait. That’s horribly over-the-top. Let’s back up a little. When I was nine, Dad bought The Death of Superman comics believing they would one day become priceless collector’s items. That hasn’t quite happened, but what did happen was that his oldest son got hooked on the adventures of Superman. So the bulk of about five or six years of allowance money went to the comic book store and, even though I’ve only bought two comic books since my mid-teens, the Man of Steel has remained my favorite superhero. In fact, I believe he is the greatest superhero (it’s another blog entirely, but Batman is the only other acceptable answer). But in September DC Comics is rebooting the Big Blue Boy Scout; resetting both Superman and Action Comics to issue #1. They’re changing things up to make him fresher for the 21st Century and rendering moot continuity-wise a lot of the stories I grew up reading. The internet is for dissecting completely inane topics, so let me offer my two cents on several aspects of the Superman reboot. This is the change that is getting a good bulk of the press. And why not? Superman’s costume is iconic. So when such a dramatic change happens and it’s actually meant to be permanent (unlike his Electric Bluegaloo costume in the late 90s), it’s going to raise some eyebrows. As far as the costume itself (in the picture above), it’s not too shabby. Creators have said that the more metallic look is supposed to give it a Kryptonian battlesuit vibe. I can deal with that. But again, it feels like unnecessary tweaking. Look, I know people snickered at the whole “wearing red underwear on the outside of his pants” thing. But, again, we’re talking about the gold standard in superhero costumes. When I started reading Superman comics, Lois Lane was engaged to Clark Kent and knew his secret identity. It took awhile before they got married. A mermaid and the Joker among other things caused Lois to call off the engagement (long story, which behind the scenes was primarily caused by the TV show Lois & Clark), but they eventually tied the knot. And I was happy. In a not-so-unrelated story, girls had zero interest in me at the time. With the reboot, Lois and Clark have never been married, never dated, she doesn’t know he’s Superman, and she apparently is involved with the comic book version of the rom-com jerk boyfriend when everyone (well, us) knows that her dweeb co-worker (Clark) is the one for her. In the new continuity, Jonathan and Martha Kent - the kindly Kansas couple that rescued baby Kal-El from the rocket ship - are dead by the time Supes starts his do-gooding career in Metropolis. I’ve done some digging on this and apparently the era in which I read comics was the only one in which the Kents were still alive when Clark was an adult. So apparently this is a return of sorts to the historical status quo. But what’s the point? It seems like a bit of a lazy storytelling advice. I know that we’re talking about a guy that can pick up a tank and fly it around the world in the time it takes to toast a Pop-Tart, so we’ve got to stack the deck against him somehow. But killing off his biological and then his adoptive parents? What is this: a Disney movie? Some of my favorite scenes from back in the day were when Clark flew back to Smallville to talk to his folks about the troubles in his life. In those loving interactions with Ma and Pa Kent, you could see how this being who could have used his superpowers to become Earth’s dictator instead grew up into a champion of justice and virtue. Plus, when Superman is having problems now who is he going to talk to? I’m sorry, but I just don’t see a heart-to-heart with Aquaman holding the same weight as a conversation with his mom or dad. Okay, that one went on a bit long. Okay, let’s move on. From what I’ve read, part of these changes - becoming a single man again and losing his parents - are to show a Superman who is more isolated. One writer said that this is a Superman that feels more like an alien in the world. He’s more of an oustider. The costume change is to highlight his Kryptonian heritage. On one hand, I understand this and it kind of fits into the climate of our present society. Yet this new alien emphasis misses out on one of the, in my opinion, defining characteristics of Superman. It is actually his humanity that makes him so super. Yes, he is an alien. He isn’t of this earth. He can fly, toss cars like they’re nothing, and shoot fire from his eyes. Yet he is often depicted as more human, in the best sense of the word, than many of his Earthling caped counterparts. He is kindhearted, compassionate, and selfless. That’s the main thing that I love about Superman. Now it’s possible that they are planning on showing Superman maturing to this place. 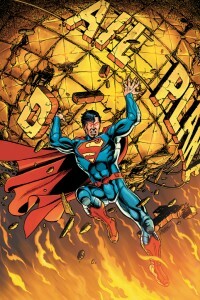 Action Comics is beginning with a storyline that shows Kal-El at the beginning of his career. I hope that’s what they’re doing. DC’s plan is actually working because it’s getting people to talk and I plan on at least purchasing Action Comics #1 to see where they go with this crazy scheme. I just hope they don’t change who Superman is at the core in some ill-advised attempt at modernization (or post-modernization). I know it is more hip to have an angsty and brooding superhero. But we don’t need an angst-filled Man of Steel. This world has enough cynicism, we need heroes that are full of hope. That is a job for Superman.